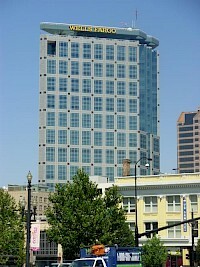 The City Creek condominium tower is a planned residential-building to be erected in the City Creek development in Salt Lake City, Utah, United States. Current plans call for the building to stand at 415 feet (126 m) tall and contain 30 to 35 levels. Construction is projected to begin when and if other City Creek residential spaces fill-up. The Salt Lake City Planning Commission has approved the project.